Original watercolor painting of with a winter view of the Corrib mouth at Galway, Ireland. Subject / Title : Waiting to Sail, Galway. Set Location: Galway, Ireland. Size: 8x10" original painting on 9x12" watercolor paper. "Gray Pockmarked Chicken Portrait ". Painting is my passion, it is my life. My favorite subjects are animals, wildlife, flowers, landscape, seascape.I worked in Watercolor, Acrylic and Oil. In 2004 I graduated from the Republic Art School in Kiev and proceeded my art educatin in National Aviation Unisersity as an interior designer. LORNE HOLLAND BOUCHER R.C.A. 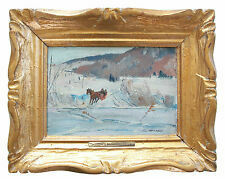 (1913 - 1978) - 'The Ice Bridge - Laurentians' - Important Canadian Impressionist "plein air" landscape oil painting on panel - signed lower right - signed and titled verso - Continental Galleries label verso - original gallery frame - Canada - circa 1950's. FINE ART REPRODUCTION PAPER SUITABLE FOR FRAMING. PAPER SIZE 14" X 11". IMAGE SIZE 12" X 8". I'm an artist, actor, and volunteer firefighter. For the past twelve years, I have been traveling in my Airstream trailer painting landscapes of this beautiful country of ours creating art that tries to capture a poetic mood. Original black and white acrylic painting on canvas panel. FREE Trial! Signed, Dated, and Titled. "I Dream of Birch Trees". 14" x 11" Original Acrylic Painting by J.T. Perkins -- signed. Paine is the son of novelist and war correspondent Nicholas Proffitt. This is a limited edition hand signed giclee by Paine Proffitt titled "CASPER". This piece is numbered from an edition of 195. Painting is my passion, it is my life. My favorite subjects are animals, wildlife, flowers, landscape, seascape.I worked in Watercolor, Acrylic and Oil. In 2004 I graduated from the Republic Art School in Kiev and proceeded my art educatin in National Aviation Unisersity as an interior designer. Size: 10x14" original painting on 11x15" watercolor paper. Set Location: Dublin, Ireland. Artist: Noelle Sullivan. the window to the right of the gate was the one suffragist Hanna Sheehy Skeffington broke out. This is a pencil hand signed limited edition lithograph by French artist Urbain Huchet titled " Trois Mats ". Hand Signed by Urbain Huchet himself. This is a limited edition hand signed serigraph by Jane Bazinet titled "Ballet Visions. This piece was hand signed by Jane Bazinet. Born in Basile, Louisiana, she began painting during the 60's. Pencil numbered from a limited edition of 2 75. Nelson studied the works of the great tonalists and impressionists, such as Inness and Monet. Title: Winter field II. Nelson studied the works of the great tonalists and impressionists, such as Inness and Monet. Floral Cobblestones French Village landscape oil painting Art on Canvas 36"x48"
Size: The painting is 36"x48", about 92x122cm. The canvas is about 39"x51". All the painting is collected from talent artists. Oil Painting is the actual item taken. phone number when you buy the item. Title: Windswept coast. Nelson studied the works of the great tonalists and impressionists, such as Inness and Monet. 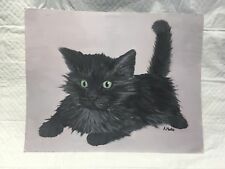 (Oil Paint on canvas of 20 by 16 by 3/4 in. (50.8 cm by 40.6 by 1.9 cm. )., including hanging clip. m960), and includes the original signature of artist on front of painting and verso, with painting catalogue series and number applied on verso. Original watercolor painting with a scene on windy Clonea strand. Subject / Title : Wind at Clonea. near Dungarvan, County Waterford, Ireland. Set Location: Dungarvan, Ireland. Artist: Noelle Sullivan. I'm Scott A. Thom. All my paintings are originally done from my own photographs or sketches. All my paintings use quality oils and canvas. ART STYLE: The original painting was inspired by Fauvism, an early twentieth century style of les Fauves (French for "the wild beasts"), a loose group of early twentieth-century modern artists (Henri Matissee) whose works emphasized painterly qualities and strong color over the representational or realistic values retained by Impressionism. Nelson studied the works of the great tonalists and impressionists, such as Inness and Monet. Title: Winter creek. French Village Cobblestone Small fountain Garden Oil Painting on Canvas 24"x36"
Size: The painting is 24"x36", about 62x92cm. The canvas is about 27"x39". All the painting is collected from talent artists. Oil Painting is the actual item taken. phone number when you buy the item. Laurelle’s major talent lies in her portrayal of what she calls “living” material. The centerpieces of her artwork are native people, landscapes, and wildlife, all arrestingly “alive” in her paintings. Kristi is also the 5th cousin to Clyde Dixon Connell, one of Louisiana's most famous female artists. A lemon wedge and horseradish sauce is included. This is a typical scene of Louisiana cuisine. DETAILS: This print is signed, dated, has title and edition number (limited edition of 250). Just a guess. have no idea who " R" is--maybe tomorrows Grandma Moses.let's hope so anyway. SIGNED ALICE IN LOWER RIGHT CORNER. PAINTED IN COLORS OF B LUES, GRAYS, BROWNS, WHITES ETC. PAINTED ON STRETCHED CANVAS. SEE PHOTOS. Add a peaceful painting to your surroundings or give a small piece of art as a beautiful and unique gift. Original oil painting study of setting sun by artist Pat Fiorello. Blues, greys, peach( a little more than evident in this photo), a touch of orange 8 x 10" canvas on gessoboard panel. Impressionism-little white bird sitting on a tree limb. Beautiful white bird sitting peacefully on tree branch. FINE ART REPRODUCTION PAPER SUITABLE FOR FRAMING. WE WILL TRY OUR BEST TO SOLVE THE ISSUE. PAPER SIZE 11" X 14". IMAGE SIZE 9" X 12". Laurelle Macy grew up on a farm in northern Canada. Rich texture and a close crop makes this painting alive and engaging. This is Professional quality oil painting. It is one of a kind. This work has visible brush strokes, full bodied and is alive. This is a painting with the light of a vision falling on the shoulders of a young fierce Chief. His hope is for a positive vision for the future. Intense eyes and the crackling fire. This is Professional quality oil painting. This is Professional quality oil painting. It is one of a kind. This work has visible brush strokes, full bodied and is alive. There are earth tones in each painting so that it fits in on any wall.